… in my family room, at a little table for two. 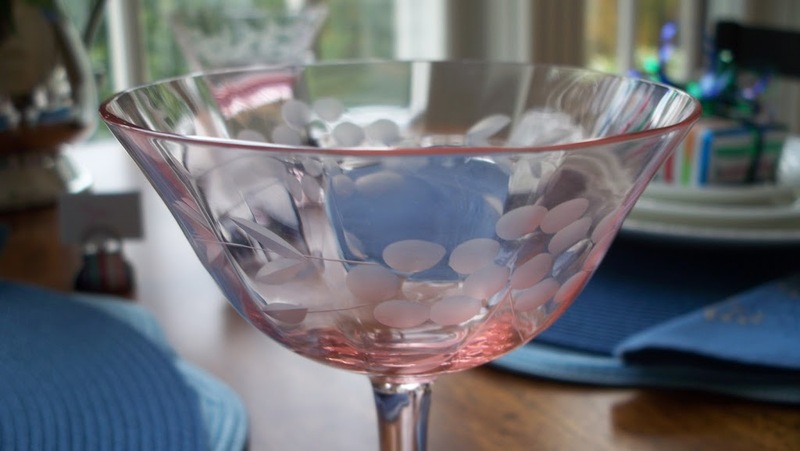 … and dainty vintage pink glasses. And let’s both have presents to add to the fun! … just you and me. I seriously love those little purse placecard holders! My daughters would adore them. Love those dishes too. I have some similar that I picked up at an antique store. I need to check and see if it’s the same pattern. LOVE the basket weave. And most of all… HAPPY BIRTHDAY!!! 29??? Very cute table. Love those purse napkin holders. 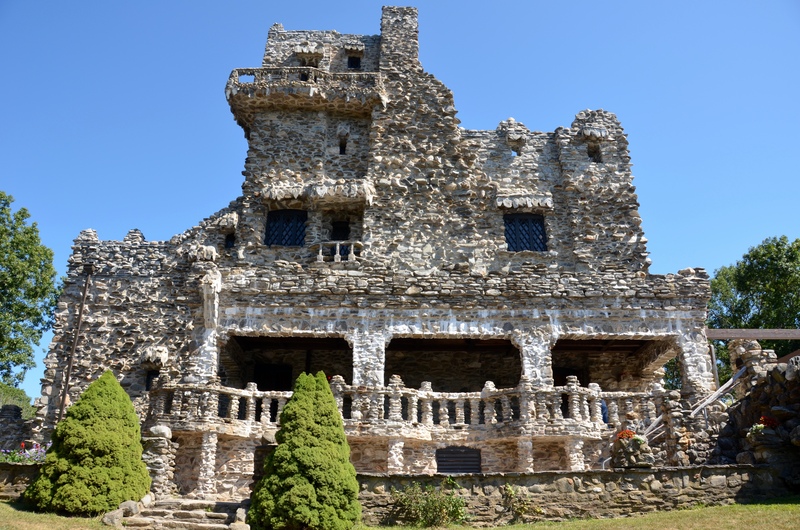 And what a pretty place you have to eat your meals. Pretty scenery. HAPPY BIRTHDAY!!! 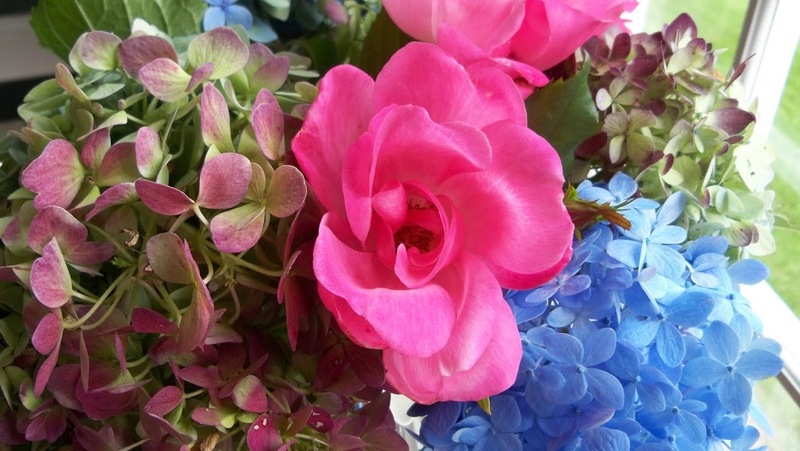 I love the blue and pink….so pretty! Wishing you a fabulous year and lots of robin’s egg blue boxes! Happy Birthday!! Love those purse napkin holders. 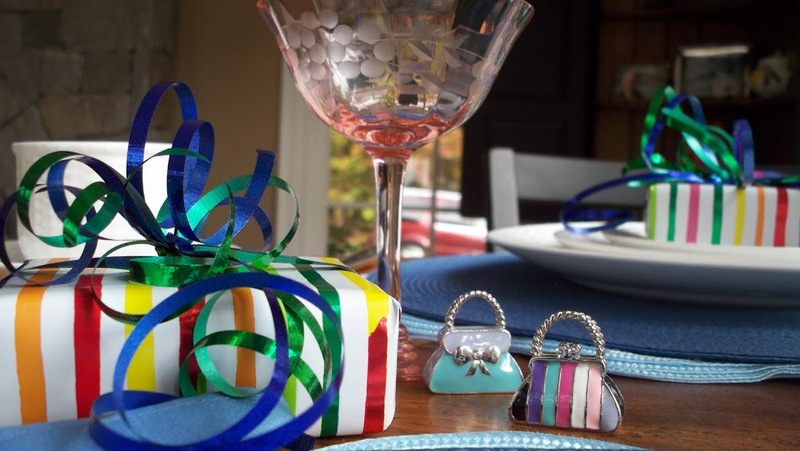 Your table is perfectly birthday fun! Happy happy birthday! I hope it’s as delightful as your wonderful tablescape. Love your purse placecard holders. Have a wonderful celebration. Happy Birthday! Your table is beautiful! I hope that you are having a wonderful birthday, and I just love your table! It’s so cute. I have Nantucket Basket, too, and I never, ever tire of it. Loved your pretty table, those cute little place card holders… DARLING… and the pretty flowers and the packages all make it so festive. Love your flatware, too. I celebrated my MIL’s birthday on my post today. I posted her party from a year ago, but I am actually late posting for her birthday since Mr. Magpie was sick and recuperating. Happy Tablescape Thursday Birthday, Linda! Ooh, this is just lovely. Thank you for the invitation. I gladly accept. Have a very happy birthday tomorrow. Í’ll be celebrating along with you because tomorrow is our son’s 21st. It’s actually his golden birthday (21 on the 21st). 😉 Last week was mine and I wished all October babies a happy one too. Enjoy. PS I absolutely love those adorable purses. Much love! Happy Happy Birthday!!!! Your table is charming and I LOVE the little purse place card holders! Oh Happy Birthday, my friend!!!!!! And many many more. May God bless you richly this year! I honestly felt like you set that table for me and you! It seemed so personal… just waiting for me! I was so drawn in. 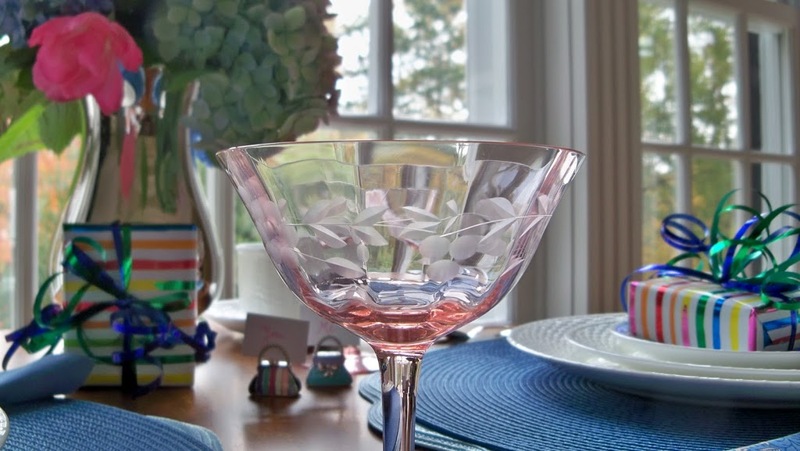 Your Beautiful dishes (oh, I love them…. 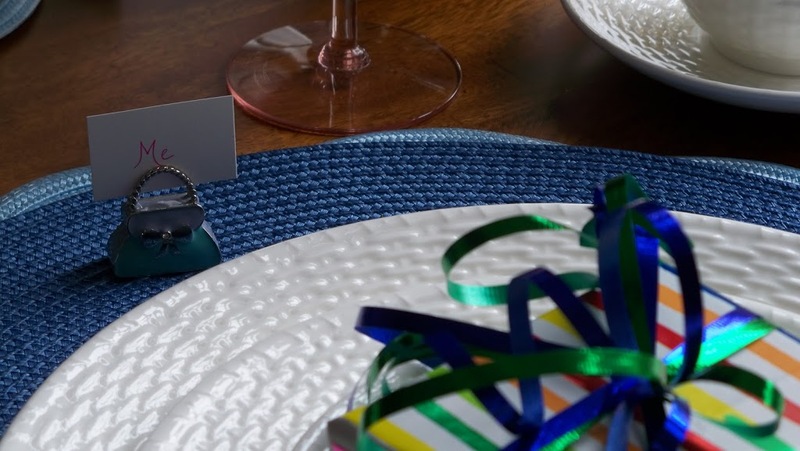 lust really) are made the center of attention by those great bright blue place mats. Perfect pairing! I love the flowers!!!!!!! They will soon be all gone, so it is so nice to see how beautiful yours still look. And your gift for me… how kind! Ok, wouldn’t it be fun to go shopping together? However, I don’t think those purses could carry enough money! I might want to do some serious fiscal dammage! Happy Birthday, Linda! You have such a wonderful flair–just the right touch! I feel like I’m really celebrating with you! 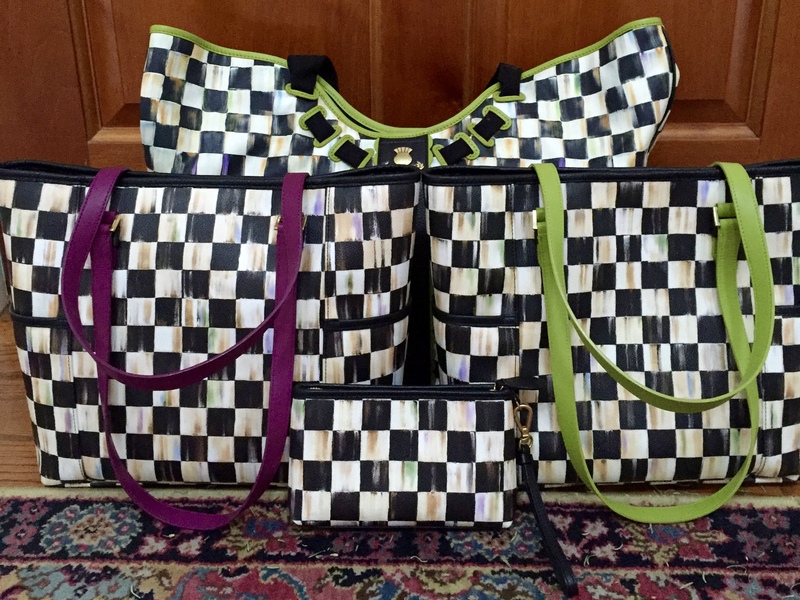 Thank you for sharing, and, by the way, love those adorable purses! LOVE the Wedgwood dishes!!!!!!!! That is such a beautiful design! 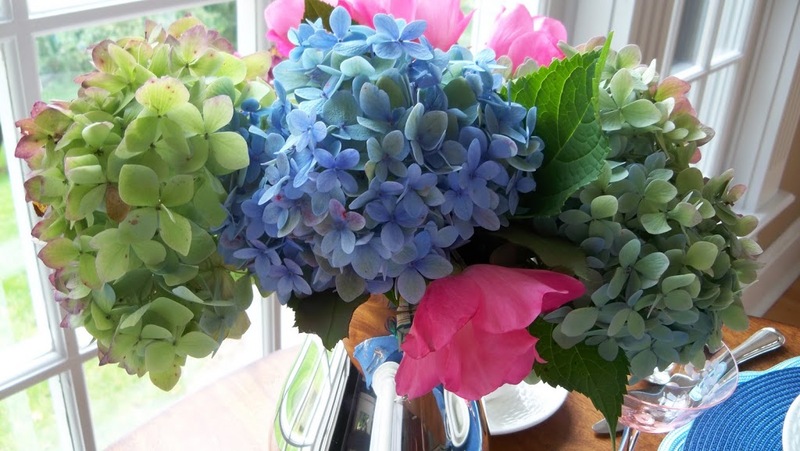 The whole table is so cute, and the hydrangea are lovely!!! Happy Birthday to you! What a lovely birthday table you have set. You are just like the Hobbits who give out gifts on their birthdays. After reading those books we always talk about that and how wonderful it would be to give gifts rather than receive and you certaily did today. I adore the little purses, let’s go shopping. I do think bloggers shopping together would be seriously dangerous, but tons of fun! Have a wonderful birthday tomorrow and celebrate each and every one. I try to just be glad I am here another year and count each birthday a blessing! Happy Birthday to you! That wrapping paper is just too precious… I so want the “you” to be ME in your party! Happy Birthday! I would love to sit at this table with you! Happy Birthday!!! So lovely setting, love the cute purses!! Charming setting! Enjoy your day! Happy hearty birthday to you. This is such a nice idea to invite just me to celebrate your birthday. And also to place a gift for me. I love that. I should have made all this nice things for you! 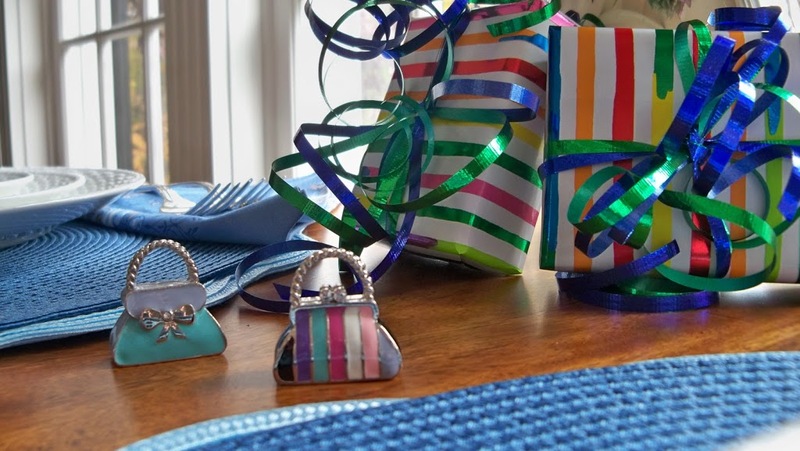 This cute little purse placecard holders are so adorable and you choose the gift wrapping matching to them. Everything is so thoughtfull and nice. Thank you, it was a wonderful evening with you. I invite you for my pumkin party, will you come? Happy Birthday Linda! I am an October gal too, Oct. 3rd! This is such a cute idea! I love your birthday table. I love how the colors of your flowers go so well with the packages! Your wedgewood basket china is beautiful! Thank you so much for inviting me and the present! I hope the rest of your is just wonderful! 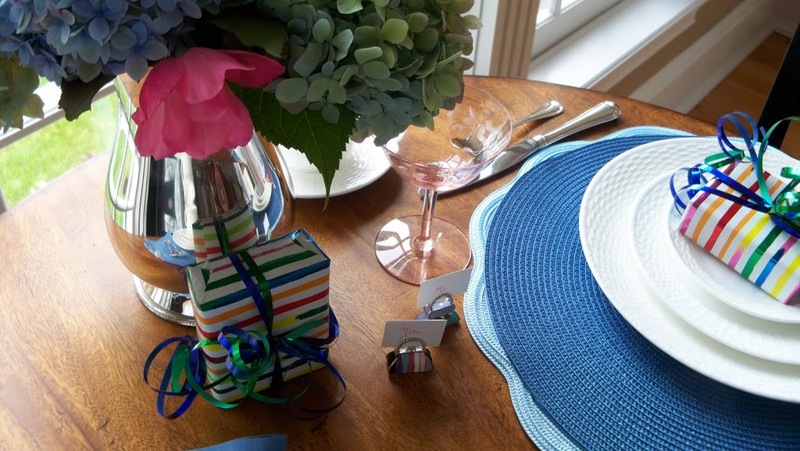 What a perfect birthday tablescape! I hope you have a wonderful birthday! I was glad to join you, as my birthday is in October, too. I also have Nantucket Basket; I love it because it’s so versatile. Adorable table! And happy birthday! Mine is next week — all the best people were born in October! 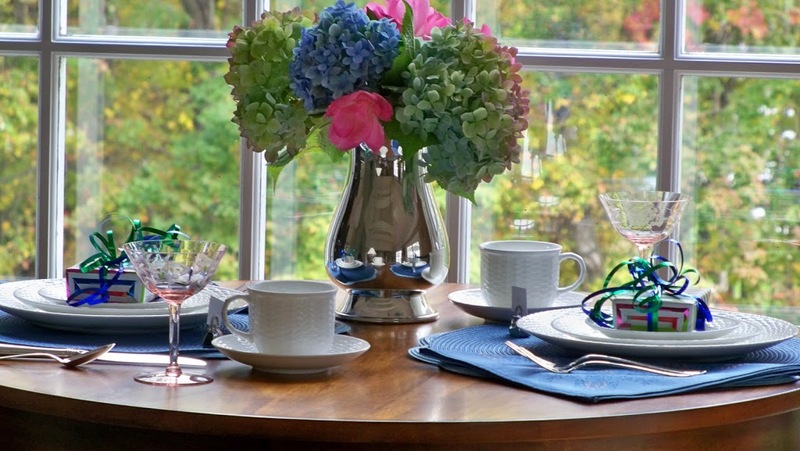 Your table is so pretty and feminine — perfect for a visit with a good friend. Happy Birthday! Your table is beautiful and thank you for inviting us to celebrate with you! My birthday is exactly one month after yours! That is a beautiful birthday table! Happy birthday! Happy Birthday,thank you so much for inviting me.And for the beautiful flowers,awwwww,you shouldn’t have,but I am most appreciative.Love this blue,now let’s tear into those presents. Happy Birthday. I am thrilled to be here. Those little purses are so cute. I love the pink goblets. 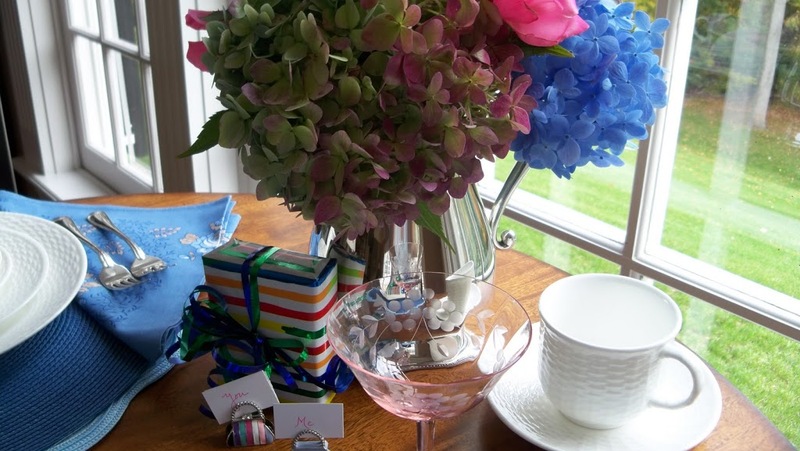 Flowers, presents…enjoy your special day…..
Love this post…your table is gorgeous and the tiny purse name card holders are divine!!! Happy Birthday Linda! Hope it is a wonderful day and a greater year for you! 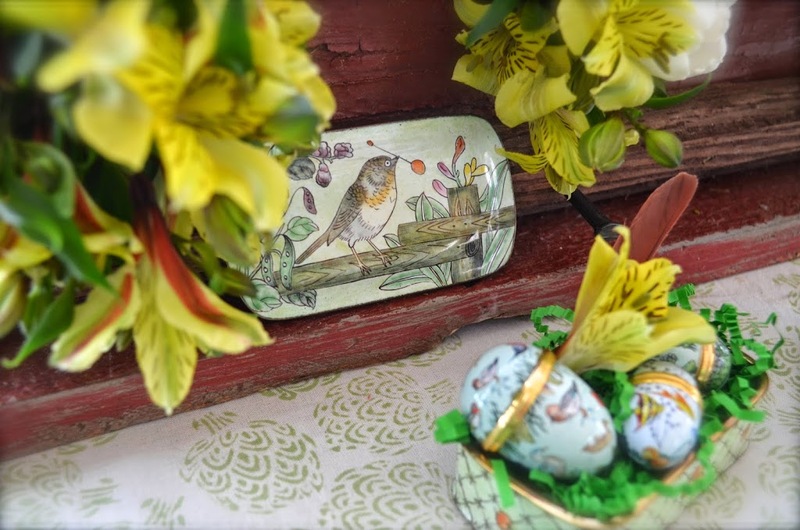 What a sweet table you have set – right down to those adorable placecard holders. Happy Birthday! I hope you get your birthday wish! Happy Birthday, what a nice way to spend it! Your table is so inviting. I was eyeing your napkins! Happy…Happy Birthday, sweet lady!!! You know, this was my dear, sweet grandmother’s birthday as well! A very special day indeed! Sending you my very best wishes and blessings for the best birthday ever…enjoy, Linda!!! Well my friend, I would love to sit and share a meal with you…especially on your birthday!!! What a lovely table you have prepared…I love it! Such beautiful blues…and pretty pinks! It’s perfect! Ohhh…your hydrangeas and roses are sooo pretty! 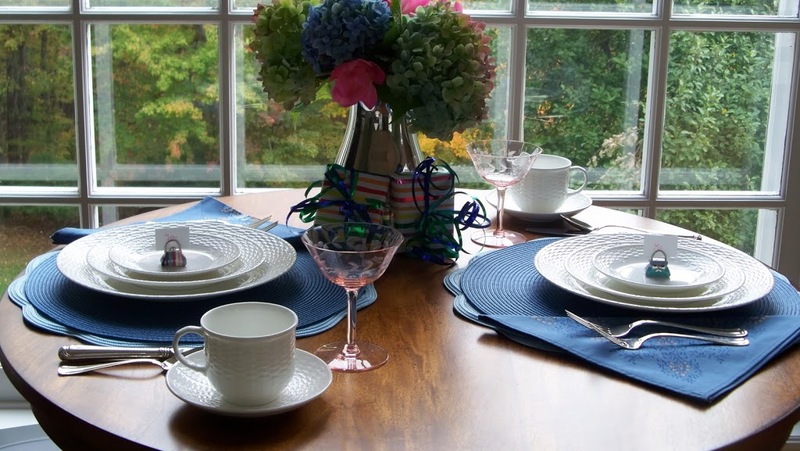 They certainly make for a lovely centerpiece for this pretty birthday table! I love your place settings! The Nantucket basketweave is really a striking pattern…I love it! 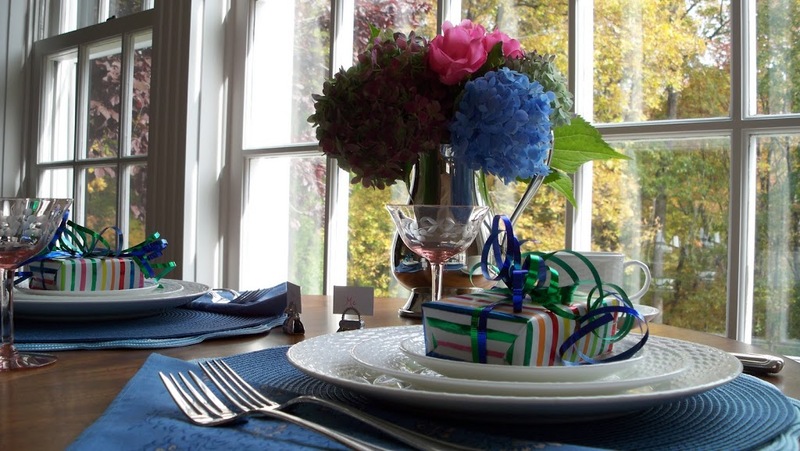 I also really like those beautiful blue napkins! It’s all sooo very beautiful, my friend! Happy Birthday!!! Happy Birthday! How charming, thanks for inviting me. Happy Birthday!!! What a nice celebration! Very pretty! and a very happy belated birthday. I too am headed to maine this weekend. The beaches. kennebunk to be exact and wells beach. the weather is suppose to be nice. Have a good time in Maine. Happy birthday! What a lovely table you’ve set to celebrate. Happy Birthy Linda!! 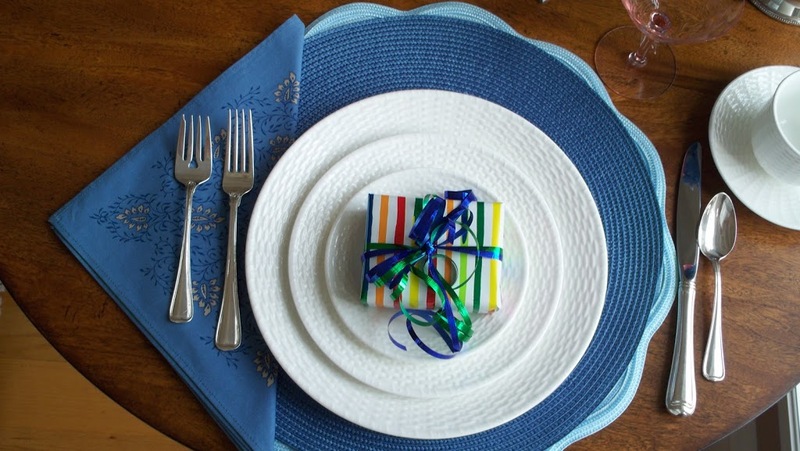 What an adorable party table setting! Those little purse place card holders are too cute! Hi Linda! Happy Belated Birthday! I would love to sit at the table for you and me! It it adorable and girl, love those purse place cards! Thanks for visiting me and following me and yes, I will be following you! Happy Birthday a day late Linda. Really I didn’t know :)) That was the absolutely cutest post. Thank you for having me for lunch!! Love the little purse place card holders and you white dishes. Happy Belated Birthday!!! 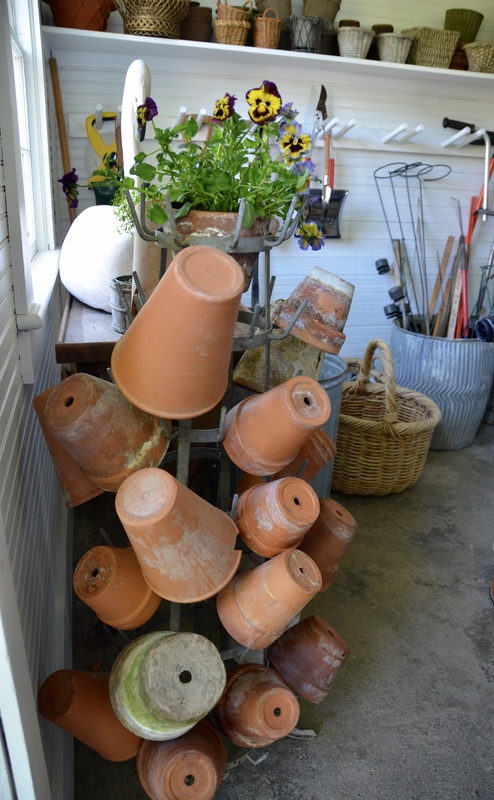 Your tablescape is so lovely and charming. 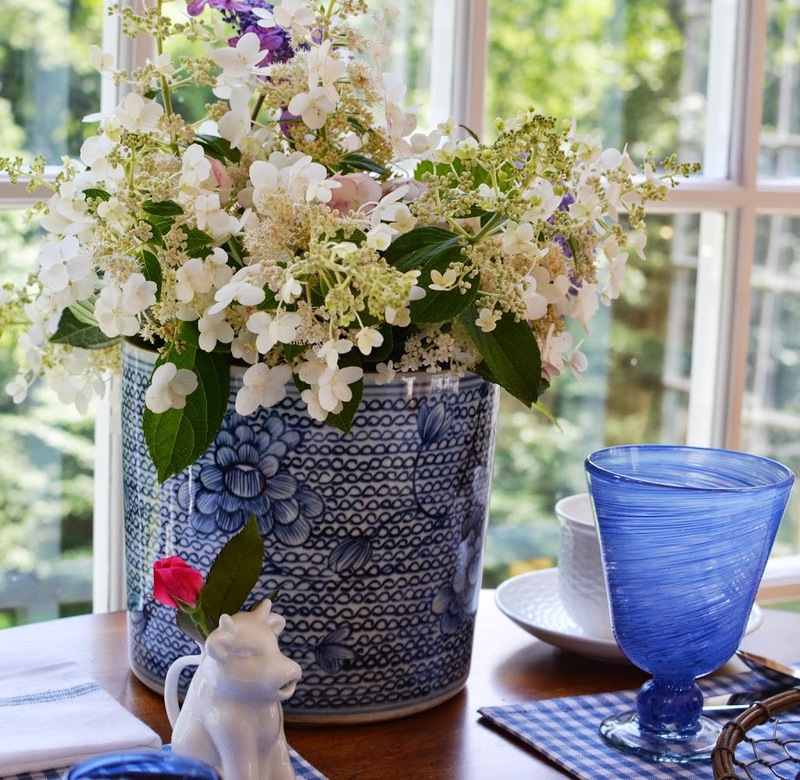 Wedgwood Nantucket Basket has always been one of my favorite china patterns. Your flowers are beautiful. I hope you had a wonderful birthday. oh how pretty. I love the dishes. they would go well all other colors but they do look lovely with the blue. I love, love, love the pink glasses. And, the flowers are beautiful. 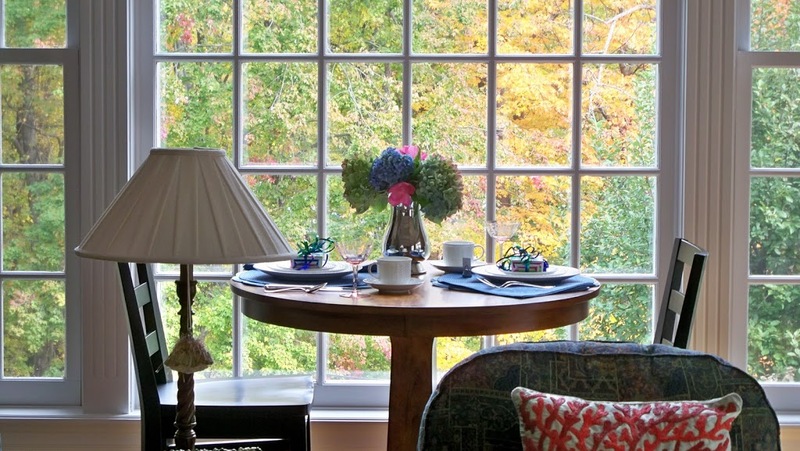 I love the big window in your family room as well. So pretty and I’m thinking it lets in lots of lovely light. YEAH! Happy Late Birthday! We can of course celebrate together at that BEAUTIFUL table…and I won’t ask how much further past 34 you are!! hehehe! Happy Birthday! Thank you for the lovely invitation! The table is beautiful. Thanks for the kind comments! Your table setting is wonderful! The flowers are so pretty! 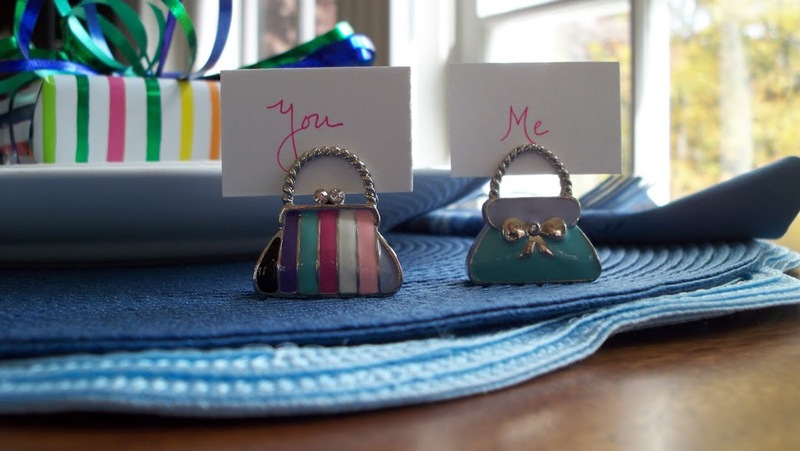 What adorable little purse place card holders! Happy, happy birthday! Your table is so festive! That silver is to die for! I love it! Thank you for your kind words on my blog! The title of your blog never fails to put a smile on my face! Hope your birthday was as grand as your table. Happy Birthday to you. The tablescape was lovely. It looks like you are a girl that knows how to have fun. Speaking of fun, I am so glad that my deer mirror brought a smile, if not a chuckle or two. I had too much fun making it. I think it is gorgeous. Thanks for stopping by. Happy Birthday to you! Made even better by winning some great cards from The handwork chronicles! 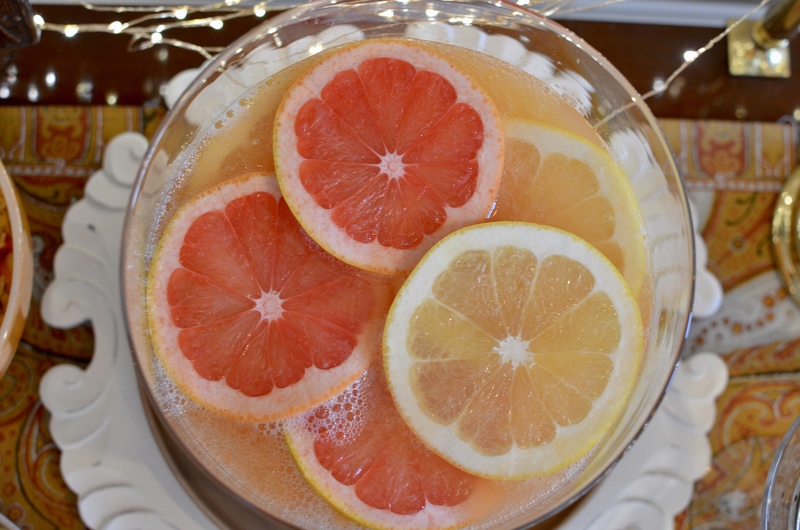 Enjoy them….and your birthday week! Happy Birthday sweet friend! Your table is gorgeous and the little purses really made me smile. Thank you for coming by. It’s always nice to see you. Stop by anytime. Linda, Happy belated birthday! I hope you had a fabulous day. 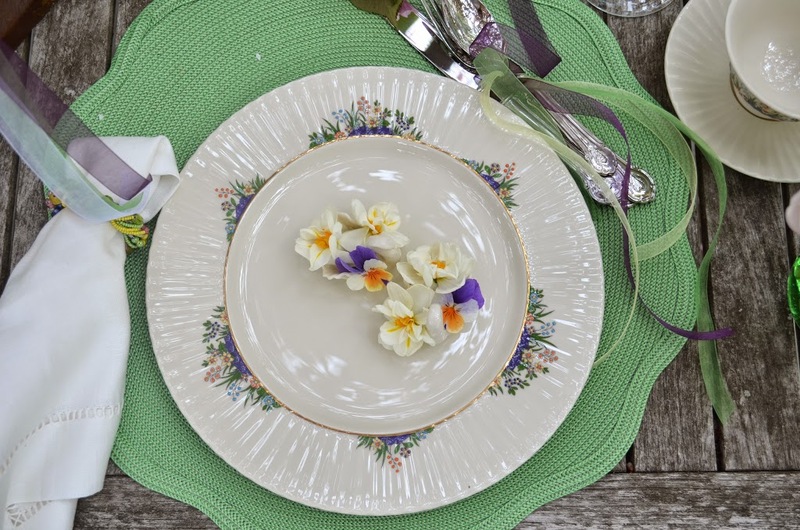 Love your dishes and the precious little purses. Sorry I am so late here. Happy Belated Birthday to you! And your table is so pretty and so charming and those cute little purse/name holders are adorable! A belated Happy Birthday to you! 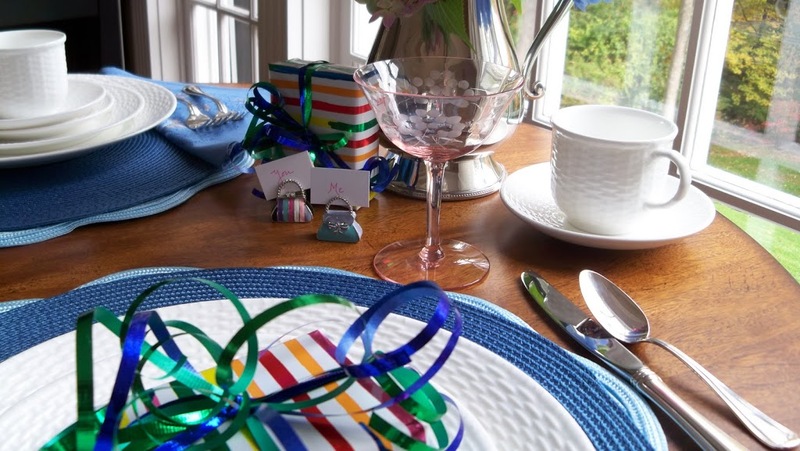 This is such a lovely post…I love the colors, the dishes, the purse placecard holders…all work together for a special birthday setting! Happy belated birthday, Linda. My sister shares it with you. I missed all these posts. I had pneumonia and didn’t do TTH. Still not feeling myself. Such a pretty table and the name card holders are so sweet! I’m so sorry I missed this post. Happy belated birthday. What a beautiful setting, so fresh and crisp. Loving those card holders. I know your children are off at college, but I hope you were able to have someone join you at that lovely table.